Father Radomir Plavsic, Popadija Alena and their four children. Father Radomir Plavsic was born in the former Yugoslavia in what is modern-day northern Serbia and spent the first part of his childhood in Yugoslavia. In 1989 his family moved to the United States where they lived in Northwest Indiana and in the Chicagoland area. After high school, Father Radomir attended Holy Trinity Orthodox Theological Seminary in Jordanville, New York, where he received his Bachelor's Degree in Theology in 2005. Following that, he lived a short while in Belgrade, Serbia, to obtain greater exposure to Serbian Orthodox Church life in an Orthodox country. In 2007 Father Radomir entered St. Vladimir's Orthodox Theological Seminary and graduated with his Master's Degree in 2009. Two years after his marriage in 2009 to his wife, Popadija Alena, he was ordained to the Diaconate in New Gracanica Monastery by Metropolitan Amfilohije of Montenegro. In 2012 His Grace Bishop Longin ordained him to the Priesthood and appointed him to the parish of St. Basil of Ostrog in Chisholm, Minnesota. Since 2016 he has also been administering St. Archangel Michael parish in Hibbing, Minnesota. In his spare time, when not serving the needs of his parish and chasing his four children, Father Radomir enjoys translating Serbian Orthodox writings into English. 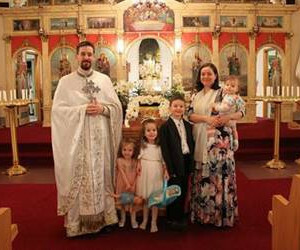 Father Deacon Joseph Henre is a graduate of the Antiochian house of studies and School of Orthodox Theology, located in Englewood, New Jersey. He was tonsured a Reader in September of 2011, and a Subdeacon in May of 2014. He was ordained into the Deaconate on September 3, 2017 by his grace Bishop Sava. Prior to immersing himself into the life of the Church, he served 32 years in law enforcement with the Kansas City, Kansas Police Department. Prior to his career in law enforcement, he served four years in the United States Navy. 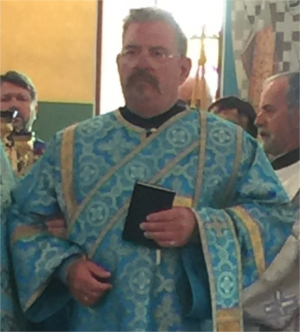 God willing (Ako Bog da), Deacon Joseph will continue his ministry at St. George Serbian Orthodox Church for many years to come; the same church his Great Grandparents help establish early in the 20th century. Deacon Joseph has called St. George his home his entire life. Father and his wife Djakonica Theresa have three sons, the eldest, Fr Patrick Henre is an Orthodox Priest in Waco, Texas, and the other two have followed in their father's footsteps and are currently serving in law enforcement. Their middle son Shayne is a Wyandotte County Sheriff's Deputy and the youngest is Chanse, is an officer with the Kansas City, Kansas Police Department. Deacon Joseph loves history, leather working and playing the bagpipes. He and Djakonitsa enjoy traveling to Waco, Texas, to visit their son, Father Patrick, wife Sarah and family. Father Deacon and Djakonica presently have three grand-children, two girls, one boy, and hoping for many more.